Sky Live Casino - If you want a trustworthy operator try somewhere else. 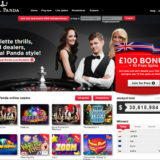 2 Deposit bonuses, 1st 100% up to £100, 2nd 50% up to £100. Wagering 20x Deposit and Bonus with 20% bet contribution. 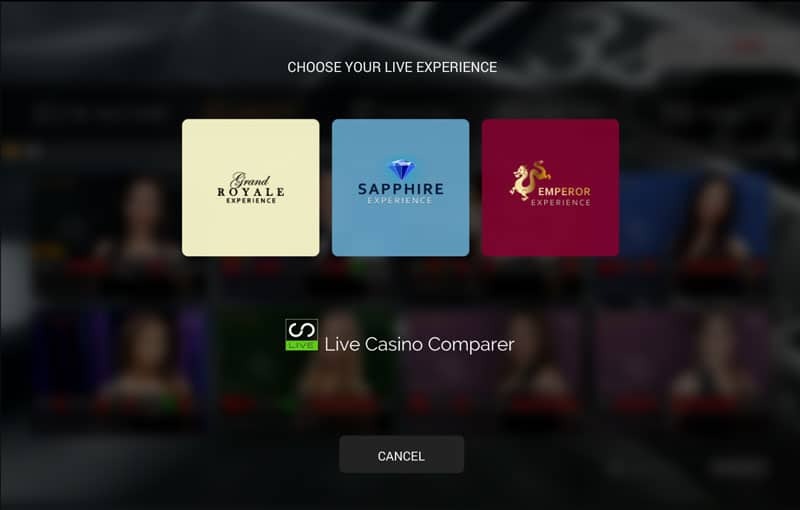 Live Casino Comparer no longer recommends Sky Live Casino. They have demonstrated business practices that lead me to believe they cannot be trusted to put Players interests first. If you’re reading this review please seek out an alternative Playtech Live Casino to play at. September 2017 – At the beginning of September Sky took a business decision that had a negative impact on all of their Online Marketing partners. 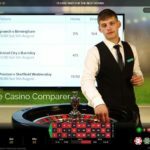 While change is inevitable, the manner in which it was made leads me to believe that Sky Casino does not have it’s players best interests at heart. I would therefore advise you to seriously consider playing at an alternative Live Casino. Fortunately, Bet365 uses the same software as Sky and also has a large set of dedicated tables. 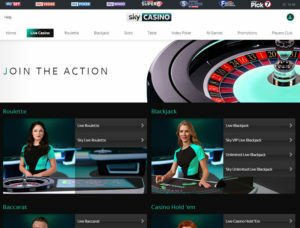 You’ll get exactly the same playing experience and actually have access to more Live Casino games than you will at Sky. I truly believe that if Sky can behave in this manner you are likely to experience problems at some point with your relationship with them. 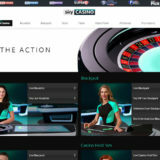 Sky are probably one of the most recognised brands in Europe for News, Sports and Entertainment. 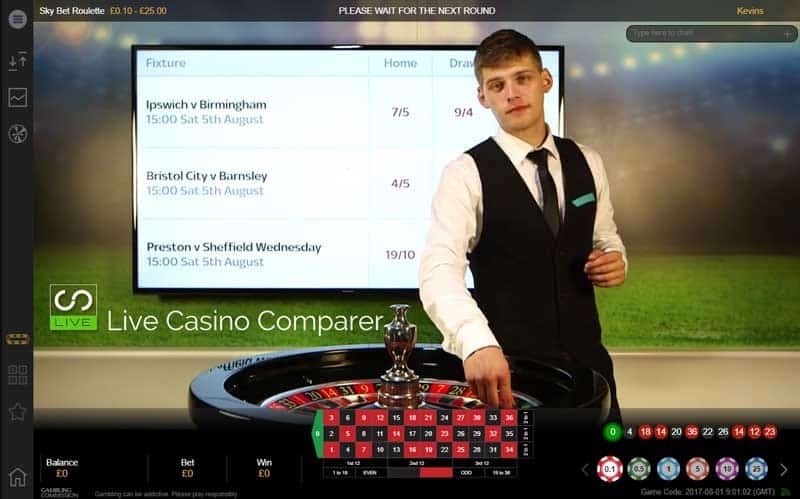 In addition, they also have a large portfolio of online gaming products such as Sky Poker, Sky Vegas, Sky Bet, Sky Bingo, Sky Casino, Soccer Saturday Super Six and Fantasy Football that arguably gives them the greatest reach of all the online casino/sports books in the marketplace. I personally have Sky TV, telephone and broadband from them and trust them as a brand that I’m happy to do business with. 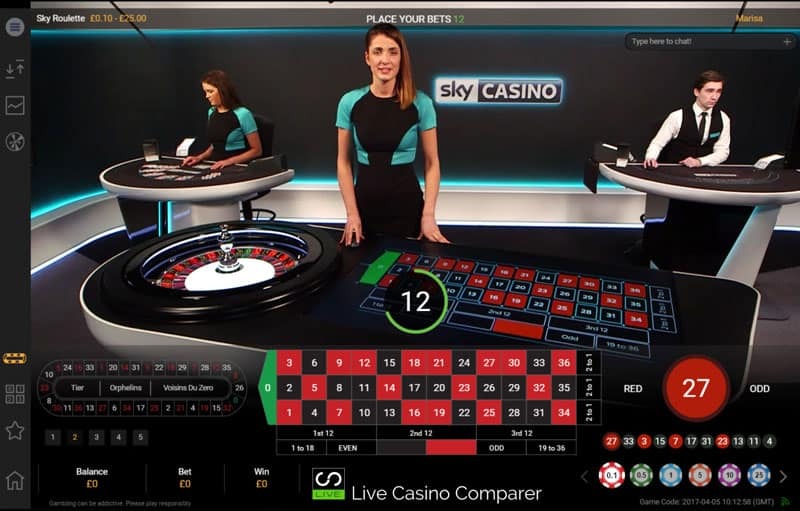 The Sky Live Casino was launched in 2014 with Playtech’s live casino software as well as online slots and games. A true competitor for Bet365 and Paddy Power. 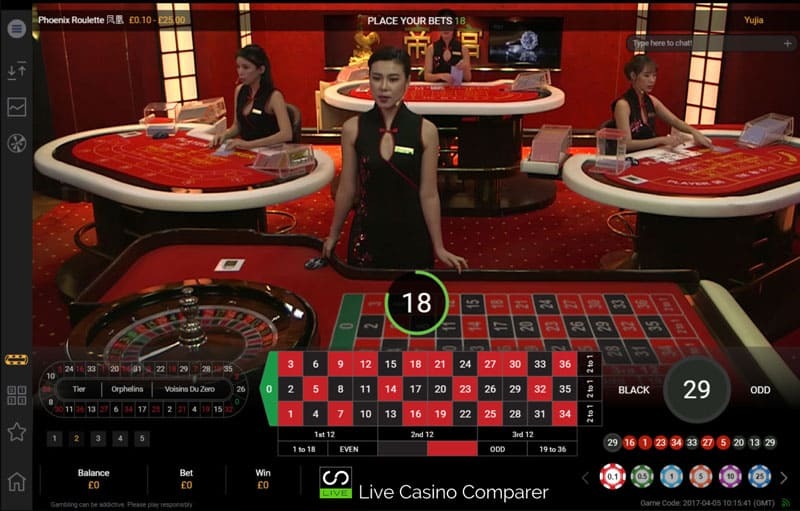 The live casino games are streamed from Playtech’s studios in Latvia and the Philippines and they have also built their own studio so they can offer a fully branded experience when playing Roulette and Blackjack. Blackjack – 7 seat blackjack, played with 8 decks with a multi-seat option. You can sit at up to 3 seats. The dealer stands on all 17’s. Bet Behind and Perfect Pairs side bets can be played. 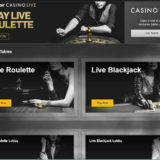 Roulette – European single zero roulette with the full range of French bets. 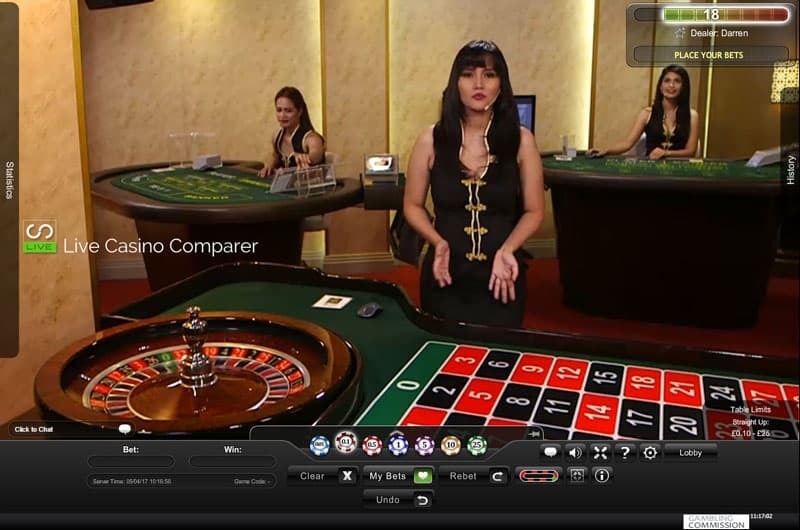 It’s a multiplayer game and you can choose whether to see the community chips and display your bets to other players. 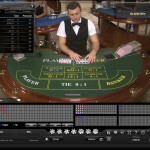 Blackjack – 7 seat blackjack with 8 decks and a multi-seat option with perfect pairs and bet behind side bets. 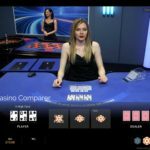 Unlimited Blackjack – this is an 8 deck game that has 5 betting positions where you can bet on one or more of the positions. Standard strategy is applied to splits and you can choose to play the hand or exit the game with your stake returned to you minus 20%. Regardless of how other players play each hand the outcome for you is dependent on your play only. For example, if you have chosen to stand and another player playing the hand busts out your stand still applies to you. 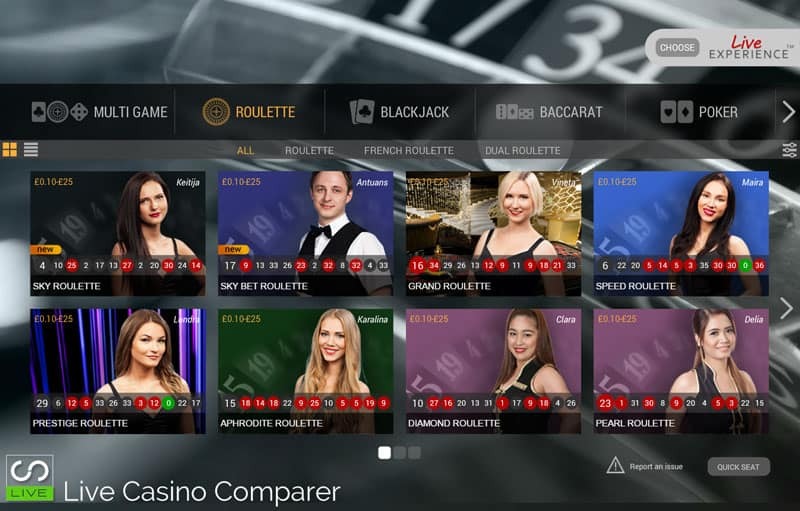 Roulette – European Roulette with a choice of tables with standard or French layouts. French and other bets are available at all tables. There is also the option of playing Automatic Roulette, where a real wheel is spun using compressed air rather than using a real dealer (It’s cheaper for the casino to do this and it gives more spins per hour!). La Partage is available on the French Roulette table. Baccarat – An 8 deck game between Player and Banker. 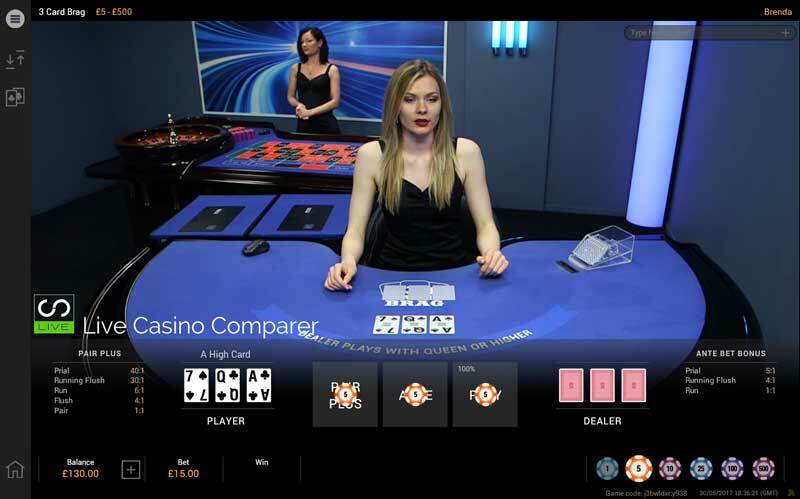 There is a range of side bets Player Pair / Banker Pair / Either Pair / Perfect Pair / Big / Small that can be played alongside the main hand. There is a complete set of Baccarat road maps for each table that gets refreshed after each shuffle. 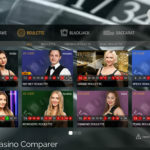 Not sure how to bet on Baccarat then check out my Baccarat Betting Strategy. 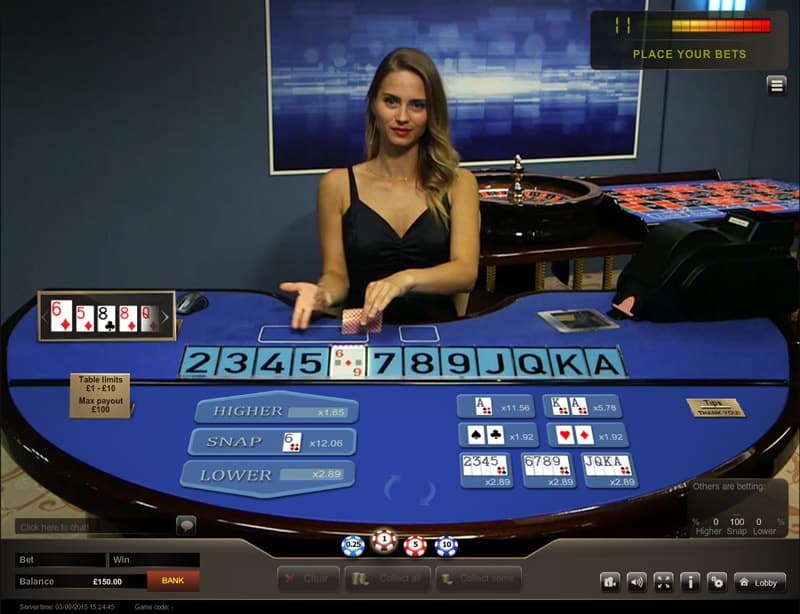 Casino Hold’em – This is a single deck game that is shuffled after each hand. Quite often there is a second person to do the shuffling. There is an optional AA side bet that can be played alongside the main bet. Hi-Lo – Played with 6 decks, it’s a simple game, where you have to guess whether the next card is higher or lower than the last one. There are a few different betting variations with increased payouts. 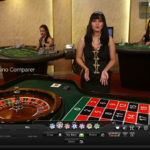 A good starting game for those new to Live Casino games. 3 Card Brag – A game against the dealer. two hands are dealt, the player and dealer. You bet on the player hand. The best 3 card hand wins. Similar to 3 card poker but the bets hand is a Prial (3 of a kind). It pays 40:1 so better than 3 card poker which pays 30:1 for the same hand. You’ll find that the Playtech software and dealers are very good. The games are relatively quick and the dealers are always up for a chat. The Sky dedicated area with its own tables goes one step further with Sky being able to offer on table promotions and bonuses. There is normally something going on every week, so it’s worth keeping an eye on the promotions page. The other advantage that the dedicated tables have over the generic ones is you’re more likely to get a seat if you’re playing Blackjack at busy times. The generic tables can get very busy. 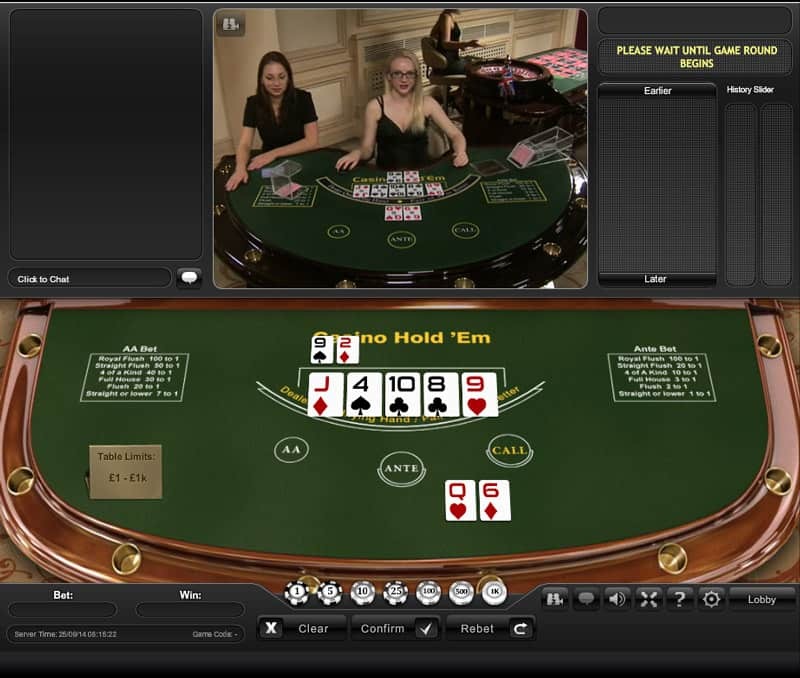 You can view the action on the tables from two perspectives, one full table mode where it’s just you, the table and the dealer. The other which is mixed mode where the dealer and real table is consigned to a smaller screen, while the rest is taken up with computer generated images of the table and cards/roulette wheel etc. It’s one of those things that you have to try out for yourself to see which one you prefer. I would recommend using the mixed mode if your internet connection is a bit laggy as the computer images are updated before the real images are. I have a constant battle with my two kids who like to stream music, movies and play games online so sometimes I have to use the mixed mode or not play at all. Guess who runs my house! 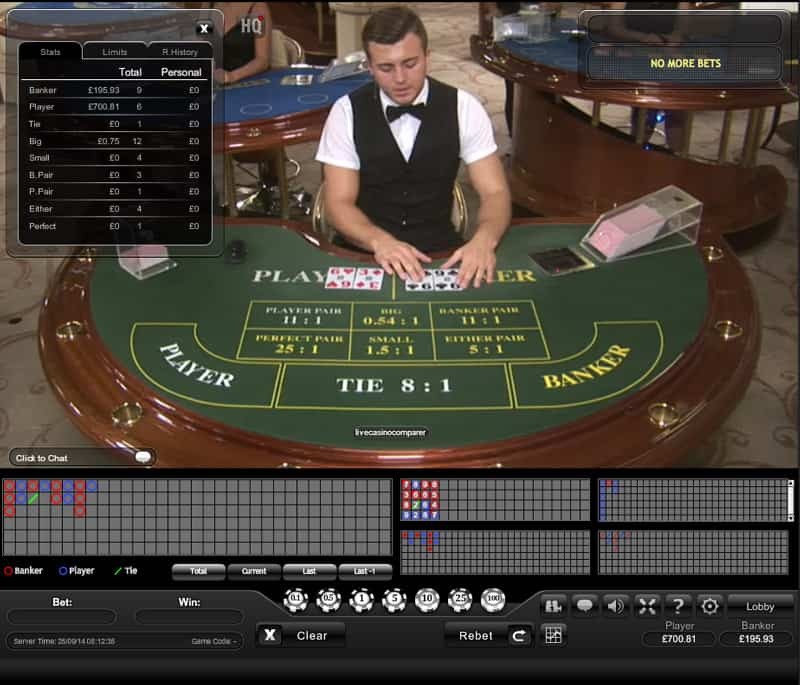 For Roulette players, there is the added bonus of being able to play two tables at the same time using the Dual Roulette function by displaying the tables together in the playing interface. If you’re located in the UK then you will experience very respectable withdrawal times. Others countries are not bad but not as quick as the UK. Sky offer deposits and withdrawals for all the major Credit / Debit cards and the most popular online wallets, like Paypal, Neteller etc. A full list of the banking options appears at the top of the page. Sky Casino hold a gaming licence from the Alderney Gambling Control Commission. I’m pleased to say that Sky Customer Service is better than you get with your TV subscription. You certainly don’t have to wait as long for a rep to answer your call!. 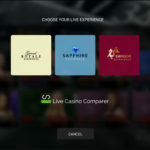 I’ve not had to use support much, which is a good thing, but on the occasions I did, to check out the terms of a bonus on live casino and get my debit card registered my questions were answered promptly and efficiently. The support team can be contacted by telephone, email and chat on a 24 x 7 basis. 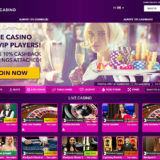 There are two welcome bonuses that can be used at the Sky Live Casino. £20 completely free when you first register an account. The £20 has to be played through 50 times before you can withdraw any winnings. All table games have a 20% contribution applied to all bets so the wagering is a further 5 fold before a withdrawal is possible. Secondly, there is a two-stage deposit bonus and this differs depending on your deposit amount. If you deposit up to £100 you’ll get a 100% match bonus up to £100. This is followed by a second deposit bonus of up to £200 for a 50% match up to £100. If you deposit up to £500 you’ll get a 100% match up to £500, followed by a deposit of £1000 will earn you 50% match up to £500. The wagering requirements are 20x the Deposit and Bonus at a contribution rate of 20% and they have to be completed within 30 days. If you’re interested to see how these bonuses stack up against the other live casinos I’ve reviewed then check out my live casino bonuses page for further details. As well as the bonuses there are regular promotions and you’ll rack up player points when you play that can be redeemed for cash. 1000 points will get you £10. 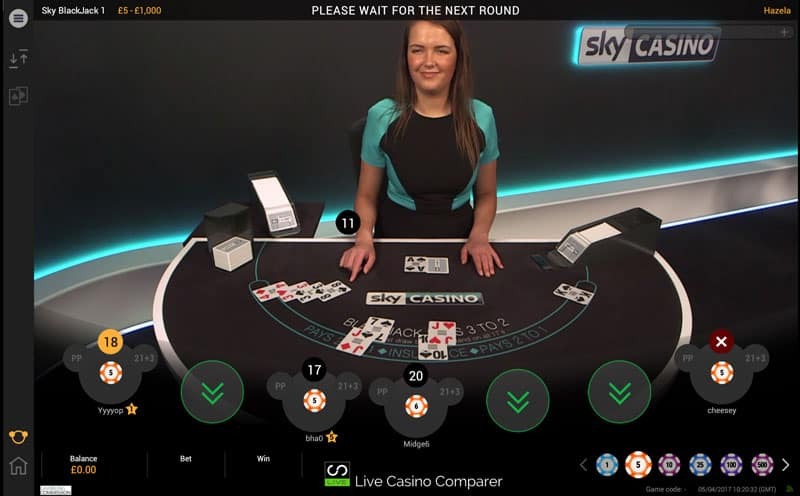 I wasn’t sure I was going to like the new Sky Live Casino as I’ve always been a fan of the Evolution one, but now that I’ve played there a few times I’m becoming a convert and have been pleasantly surprised. The dealing room looks great and so do the dealers in their smart new uniforms. There are loads of dedicated tables and plenty of generic ones with different games, so whatever you favour you’ll find it here. The only downside is there’s no 3 card poker (3 Card Brag is a good alternative) but you can head over to Grosvenor Casino to play that. I’m certainly comfortable playing at Sky and I also dabble with Texas Hold’em Poker occasionally at their poker room. The fact that they process withdrawals quickly is a major plus point for UK based players so I’m happy to recommend that you try playing there, even if it’s just to use the free £20 no deposit bonus. What have you got to lose?